You can also join, share, and sell our healthy living nutritional products of whole food plant based nutrition and aeroponic growing gardens by joining our virtual franchise business. Learn more about what we do here below to see if you too would like to join in helping create an even greater healthy global impact. Our healthy living Virtual Franchise business opportunity is open to anyone who wants to make a difference and empower themselves within their own life and also in the lives of helping others. There is always room for more positive growth. Creating your own business today is not only convenient, sometimes it even becomes very necessary in life. The wellness products I choose to share and sell are a part of my own daily healthy living lifestyle that I both believe in and live by. Using Network Marketing within a wellness industry, you may at first think your reward is only to make money. However once you begin, you quickly realize the freedom of doing what you love daily along with the power of being able to help impact and change the lives of many, outweighs everything else. Your happiness takes over and all other things begin to fall into place naturally. We are a healthy lifestyle business that helps change the lives of families on a large scale by combining making income with supporting overall health and well being using plant powered nutritional products. We use network marketing by gaining "active" customers and we build in a network of growing teams. 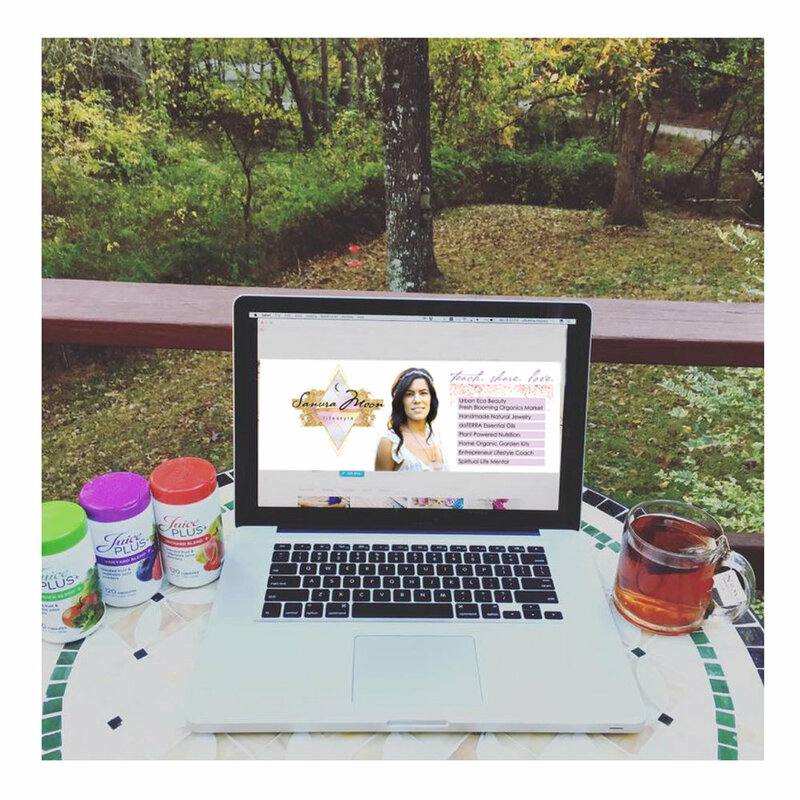 The only business cost to you is $50 to open and own your own Virtual Franchise healthy living network marketing business and become your very own healthy entrepreneur in this growing wellness industry. It is a one time fee per year of only $50 and includes a great deal of value, opportunity, training, and business tools, including your own direct website. Owning your own business has never cost so little, nor been so simple to begin now that we have the internet at our fingertips and empowering growing network marketing companies like Juice Plus that only keep growing stronger every single year. You get your own personal website; 24 hour online service; customer service; your own virtual office; customer accounts for each customer are provided; online marketing materials including videos that you can use at anytime to help your business grow; business promotional tools; you get to use the mission driven model which has everything you need to know to build and help your customers; and the Healthy Living Revolution site; 100% team support and added to our private FB team group page of over 1,000+ woman. Use the info below here as a quick reference for your business needs and the steps to get your network marketing business started right. Learn how to use your virtual office, set up your website, place orders, and run your business correctly. In a Network Marketing business it is very important that you know your products well. Take the time to study them and really understand how they work to share the true value of each. Sell by sharing your products using your own personal story. Speak directly and let your personality shine through. Make sure you are fully prepared to pitch your products and do it with honest integrity. The biggest factor in selling and sharing anything is having belief in yourself first and in the product. I only share the products I use and believe in that work for my own body. When you truly love your products, just like I do, it will flow naturally through you on how to share them. Listen and answer others with honor and respect. Show them that you care about what their needs are. Sharing your own story will show others that you care about taking care of your own personal health and lifestyle. Others will see this and then share with you about their own lives too. So we are all good listeners and helpers. For example, think about the last time you bought something you truly loved. What did you do next? Did you share about it with anyone, or take an instagram image of it and say hey I got this and I love it! Or how about the last really cool place you ate at, did you share a photo or story about it with your friends? When you bought something you love, or ate at a cool place, or did something great for yourself, most of us share about it right? Well, network marketing works the same way. However instead of sharing with just friends you want to focus on sharing with those you don't know and build relationships that way, creating your own network of opportunities. When people teach to go to your friends and family that is nice, but this is a business, so you want to focus on building clients and lasting relationships. Your friends will already see what you are doing because they are your friends. Family will mostly watch your health transform from using the products. Then they will most likely ask you what you are up to. Let those that know you come to you because they will see what you are doing already. Focus on finding those you don't know, that maybe interested in what you offer and are in need of it. You want to know your customer type and those that maybe looking for what you offer. You need to know who your target audience is and who your customer truly is. Attract those that are interested in the types of products you offer. For example, I received a FB message from someone telling me I needed essential oils in my life, however if they actually looked at what I do, and who I was, they would see that I already use, share, and sell them. It looked like a copy and paste message too. Never do that, its not business savvy at all. When you work your business think smart and always think ahead. We learn as we grow, but we can learn a lot from mentors who have already made the mistakes and done the work. Try to be original and stand out and see what others have tried in the past and learn from it. We all learn from each other, that is how we grow. A child learns from following their parents and so on. We become real game changers as we continue to learn more. Before you approach someone head on, maybe do a little research on who it is that you maybe talking to next. Another great way to find customers is to search out those that are searching for nutritional based healthy living products. You can also talk to those that are all about nutrition and like to see what products are out on the market. I do like to know what new nutritional products are on the market and I am always keeping up to date on things like this. But my point is, you need to know your customer. Not like a best friend, you just need to know who your target audience is and who you want to attract to your wellness business. Just like relationships, the first couple years of owning your own business will not be easy. You learn as you grow. You learn as you get to build the relationship between both you and your business. It will mold around you. It is a very exciting process that can empower you as you become your own business owner, a mentor to others, and also as a leader. This business can truly create a positive impact in your life as a whole, that is why I love what I do. Be an example to others by inspiring healthy living around the world. Being a positive example is the best way to do that and will naturally attract the interest and attention of others. Your next goal is to get others curious enough about what you're doing and to ask you about it. Social Media such as Facebook is a perfect platform, but your person-to person conversations are just as important. Sharing things such as "I'm sleeping better than I have in years!" will create curiosity and generate wellness questions. Your Virtual Office is a place for only you to use to sign into your own account. Your entire business runs from your personal online virtual office. Log into it at least once a week to check for updates and to keep track of how your business is growing. Always use the link above to sign into your virtual office. Make this link into an app on your cell phone so you can log into it at anytime. Also make a quick click app on your phone for your direct JP shopping website so you can quickly copy the link to text it to any customer that may need it. Your customers also have a place where they can log into their own accounts to track and manage their very own product orders. They can make their own updates and see when their orders will be shipped to them and so on. You will receive a Welcome Email after you sign up to become a Representative. You will also receive a welcome pack in the mail explaining the business. Follow the steps in the video above to set up your account, personal website, and to set up direct deposit for the commissions you will be making from your product sales. Get to know your virtual back office by taking personal time to learn it and understand all its tools. When I first began I wrote down some questions about my Virtual Office and called them on my own free time to make sure I understood everything properly. They are always ready to help us every step of the way, and our team is here to help you too. It is very important to first follow the steps in the video above and set up your personalized website shop included in your business. This is the site you will be using to show customers so they can order from you directly at anytime. Use the option they give you to upload your personal photo so that people can see your beautiful smiling face when they click on your site to place their order. Make sure to have your personal website listed on both your personal Facebook page and your Facebook business fan page, under "info about you". If you have an existing business website of any kind, make sure to add this link their too for your clients so they can see all that you do and provide. For tips on how to grow your Juice Plus Network Marketing Business using social media and Facebook check out this helpful YouTube channel. Learn to use these tools with intention. Facebook and Instagram will be your biggest platforms to use to grow your network marketing business. You must learn how to use these tools wisely and that is always an ongoing learning process. But if you read, watch, and learn using great mentors you will be able to begin so correctly. Young People ages 4-18 are FREE to take the chewable or capsule blends. For each parent, grandparent, or any adult (18+) guardian that is personally taking the capsule or chewable blends they can sponsor one child per adult (for up to 4 years) for FREE. The capsule or chewable blends are also FREE for any full-time undergraduate college student in a four-year degree program. Any adult (18+) taking the capsules or chewables can sponsor a college student (up to age 21) for FREE for up to 4 years. The Virtual Franchise is a lawful and legitimate empowering business method that uses a network of independent representatives to sell healthy living consumer products. Compensation is based on residual income (royalty pay) and based on the sale of products to the ultimate consumer. We are product and customer driven, which means we love and care about the products we sell and we care about the customer and their well-being. This Virtual Franchise Network Marketing Business offers us the opportunity to sell established branded products through a market-proven system supported by a corporate office. The Virtual Franchise does not include the large franchise fees and other investments required by traditional brick-and-mortar franchise businesses, however. Representatives are not required to purchase any product inventory, because the company ships directly to the consumer when orders are placed. In addition, the company closely monitors purchases of the product by representatives to ensure that they are not accumulating product. Just like other businesses this Virtual Franchise provides full-time representatives who have reached the highest level of leadership in the company access to many of the same benefits that corporate employees receive, including health insurance, life insurance, disability insurance, dental insurance, a family tuition fund, and a year-end bonus. When you meet someone who would like to join the business, you do so by building in teams, creating your network and repeating it in an organized cycle. A smart leader also connects people that can be stronger together. Always think about the big picture. Structure your teams so people can work together while helping to create a beautiful positive impact that flows. Network Marketing works by word of mouth, social media, sharing your story, and just meeting everyday people and introducing them to the lifestyle you live with your healthy living products. Network Marketing produces Residual Income - income you continue to earn based on the efforts you put forth initially and continue to. This income is based on the sale of products and services. These products then continue to generate repeat sales. This helps offer not only financial freedom but the freedom to live your life as you intend; by also your work ethic and savvy business planning. Network Marketing is one of the smartest ways to work and run a business. I have seen some argue this fact who are working a job that pays hourly for the time that they are there, but for example not for the time that they are not there. Then if they don't go back to that hourly based job they make $0 income which results in $0 return for all the time they actually put into it. This could even be for many years spent at one job and if they leave or were to get fired they may realize they have nothing to show for it. That to me makes no sense, so I don't work at an hourly paying job and never will again. Some however, may choose to stay at an hourly paying job with weekly pay-checks just because they want to get paid hourly and never build upon much else. It all depends on what you personally want. I am here to teach you to make money that has a return on your life and time while building you up and weaving together your complete lifestyle. All the effort you put into it always pays off and will for years to come when you stay with it. I believe in building positive wealth and growth that creates a healthy impact. When you sign people up to order these amazing healthy lifestyle products they are going to keep ordering them. Your customer then in turn usually always shares about the product with others. Just like word of mouth works for any business. In this way you continue to grow and you are always making a return on your investment, or the time you put into it all. The only way your business stops growing is if you stop building. The Network Marketing industry offers many unique benefits to those who want more out of life. Some of the best known companies in the world like this one fall under the network marketing umbrella. When I also learned about the strategy of "Feel Good Marketing", I then completely realized that is what I do daily. It is exactly how I sell and share all the products I love. This business is truly what you personally make it to be for you, who you are, and for your own lifestyle. That is why everyone does it differently while making it more personalized and unique. The ones that get it, are the ones that keep growing and profiting from it. What If Someone Calls What I do, Some PYRAMID scheme? If anyone were to call your network marketing product business a pyramid scheme, you can answer them both kindly and logically, it's a very simple answer. If anyone asks or makes accusations it is only because they are not educated properly on the subject, so we can help educate them. Usually no one would say such a thing because this business is over 20+ years old, however there are still some out there that do not at all understand what a network marketing business really is. Many shop for wellness products at a regular store, but this is hands on with someone who knows the product in and out and is also using the actual product. Even walk in a store and there is no one to ask about what you are really looking for? This is a hands on business, our clients look up to us and we look up to them too. Pyramid Schemes are actually illegal and offer no real product. Pyramid schemes may disguise themselves as a network marketing company or MLM, however there is either no product involved, or the products are disguised and no work is done to market the actual product nor actually put it into any real existence. Pyramid schemes also make promises that you will make a lot of money quickly with no work ethic. They try to recruit people as fast as possible because they are never in existence for long. They have to move quickly in and out because they are illegal. That is why it is said that the ones at the top are the only ones making real money; which is very true because it is a scam and that is how all scams work. Those that are in charge of the scam at the top, logically make all the money. Then those pulled into it make no money because they were blinded into the false scam. Its truly sad that people would even call someone else's beautiful wellness business a scam, but there are some out there that are just honestly that misinformed. So we are kind to them and simply set the truth right. People that ask usually are those that have no idea what Network Marketing is nor how it even works. A great movie to watch to understand business scams or banking scams is the movie The Big Short. Anyone that owns a business should watch that documentary movie. It shows us honestly how we were all scammed by the Big banking system. What is the difference between a Virtual Franchise and a MLM?